Lawsuits and other important legal proceedings cannot move forward unless all parties to them are provided with proper and timely notice. To that end, state, federal and local courts have established rules that govern exactly now such notices must be delivered and certified. Because providing notice must be done in a very specific manner within given time frames, it is often most expedient to hire a professional to do the work. A process server with experience will understand how to find the party at issue, properly serve the paperwork and file the certifications the court needs to see. Price is almost always a key consideration in securing the aid of a process server, but it should by no means be the only one. Finding a team staffed by individuals with a strong background in the field and those with the proper credentials is vital to success. Searching online for process servers in the local area is a smart way to find the professionals on which lawyers, law firms and others in need of this type of assistance regularly rely. Speaking directly to court personnel and legal professionals in town is almost certain to yield the names of those who can facilitate quick service of process. When a lot is at stake and the future of a legal action turns on proper service of process, nothing should be left to chance. Ensuring that paperwork is delivered to the right person and that certification and proof of service is completed accurately and submitted to the correct authorities is pivotal. By taking the time to review the options when it comes to process servers, litigants, lawyers and others in need of help can rest assured that their documents reach the intended parties and nothing will undermine the progress of their cases or the pursuit of their rights. Why Hire a Process Service Sacramento? 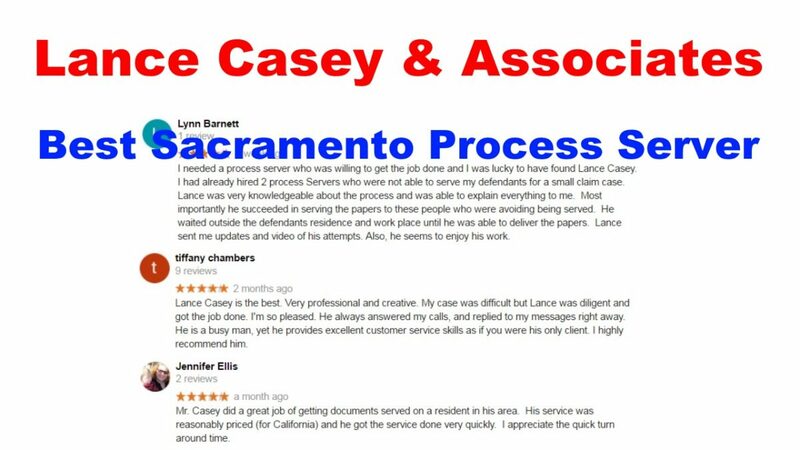 You will appreciate the fact that local process servers in Sacramento can get the job done the fastest time possible. After all, there is no need to send papers to the main office before forwarding these to the recipient. The more direct the path of delivery is, the quicker it will take for the papers to be served. You can email your documents to us at Ljkc916@gmail.com.